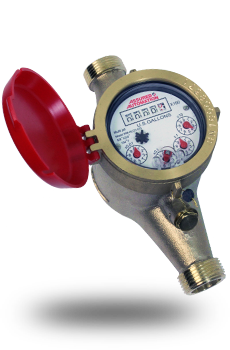 The WM-NLCH Series lead free hot water meter is a user friendly, multi-jet totalizing brass water meter. The WM-NLCH Series can handle water up to 194° F and features a removable and cleanable strainer at the inlet of the measuring chamber. Available in ½” to 2” line sizes with NPT end connections. Operating using the multi-jet principle of measurement, water flows through the WM-NLCH meter’s strainer into the measuring chamber where it drives the impeller. The impeller in turn drives the mechanical register dials by means of a magnetic coupling. The impeller is the only moving part in contact with water, resulting in long life and consistently reliable operation. The easy to read register displays US gallons. WM-NLCH is designed to accommodate the addition of a dry contact reed switch pulse output. The pulse output switch installs simply with one screw. There are two pegs on the switch that insert into two holes on the face of the meter to ensure proper positioning over the correct dial needle. Pulse output is commonly used for system automation, remote meter reading or adding a resettable batch total to a totalizer only meter. Constructed in conformance with AWWA C708 and NSF/ANSI 61 Annex G standards the WM-NLCH Series conforms with lead-free plumbing as defined by California, Vermont, Maryland and Louisiana state laws and the U.S. Safe Drinking Water Act that took effect January, 2014. In keeping with our strict quality policy this meter is produced in an ISO 9001 certified production facility. 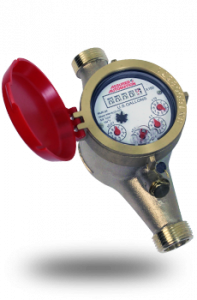 Typical uses of the WM-NLCH lead free hot water meter include residential and commercial metering and sub-metering applications that use hot water: industrial food, beverage & plant process water usage, industrial laundry, industrial baking, cement mixing, apartment/condo complexes. Accessory items for the WM-NLCH Series include check valves to prevent the backward flow of fluid through the meter which protects the meter as well as upstream water from any contamination introduced downstream from the meter. Garden hose adapters are also available which allow inline installation into any garden hose or garden hose spigot. This entry was posted in Flow Meters, Latest News and tagged baking meter, brass water meter, cement mixing meter, commercial water meter, hot water meter, industrial food meter, industrial laundry meter, lead free hot water meter, process water meter, residential water meter, sub meter, WM-NLCH. Bookmark the permalink.